Hi, everyone. Welcome to today's Whiteboard Wednesday where we're going to be talking about, "Beyond Salary, the Benefits of Working in a Law Firm." 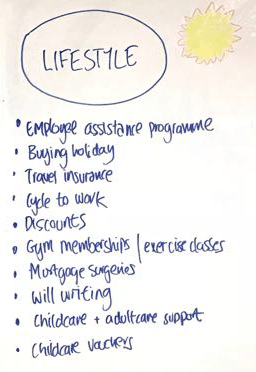 So we thought this would be a nice session to run today because often, we find when our trainees join us, they're really only focused on their salary, and they're really surprised to see how many benefits are available to them. 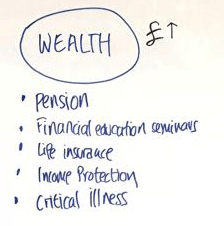 So in today's session, we're going to really talk about what you're going to find in a top city law firm, such as Shearman & Sterling, and I've split this into your, sort of, three categories of benefits: health, wealth, and lifestyle benefits. So talking through the first one... I mean, I'm not going to flip through all of our benefits, but what I'd like to do is focus on the most popular benefits you're likely to find. So health benefits tend to be around access to treatments and private treatments. 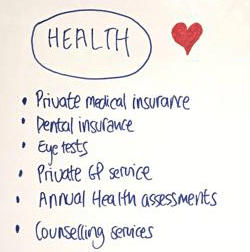 And this can be in the range of general private medical insurance, which is about general treatments, dental care, eye tests, eye care, GP services, annual health assessments, and really, also, supporting mental health with counseling and psychotherapy services. And the reason why these ones are really popular is because they tend to give really high-quality treatment, but also, much faster access to treatment. So we find that the health benefits tend to be the most popular benefits amongst our employees. So next, when we look at this, it's wealth benefits, and I like to split this into what I call, sort of, wealth-creating benefits and protective benefits as well. So I'd say the most popular benefits within this is your pension, and a pension is a long-term savings plan for retirement. And what you tend to find with this is that most firms will offer something, which is called a matched contribution scheme. Now, what that means is, say you, as the employee, join us and put 5% of your basic salary into a pension scheme. The firm will match that 5% with another 5%, so 10% is getting into your pension pot, so it's really doubling your pension pots in that way. So that tends to be very, very popular. The other ones that we tend to find, which are sort of a given, as well, is, sort of, your protective benefits, which, sort of, mitigate risk, and these tend to become more important to you as you have dependents. And the reason being is that they give you, sort of, a lump sum to, say, someone you nominate as a beneficiary, and in the event you pass away, or if you develop something like a critical illness, or, say, a long-term disability, it gives you access to a percentage of your salary or a lump sum in the event these things happen. So those are your wealth benefits. So now, I'm going to talk to you about your lifestyle benefits, and this tends to be the biggest category. And actually, probably, for trainees, the most popular ones we tend to find trainees really like is buying holiday, travel insurance, which is business and travel insurance, and I'd say the other one is gym memberships as well. So the reason why these ones are quite popular, especially the gym, is it's usually subsidized or on-sites or there's access to classes as well. So, for example, at Shearman, we have an on-site yoga, which is very heavily subsidized. With these benefits, we'll say, as you have a family, sometimes, other benefits become more important such as child care and adult care support, as well, if you're looking after elderly dependents, childcare vouchers as well. And also, if you're buying a home, people are really interested in our mortgage surgeries, too, and that's around giving you access to mortgage services when you're buying a first home, re-mortgaging, or even looking to buy something abroad. So that's a summary of our benefits, and I hope you've really enjoyed the session.